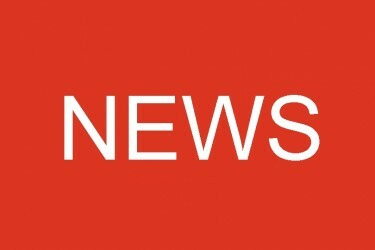 The tenth J’Rat digging award has gone north of the border – for the third time in ten years. 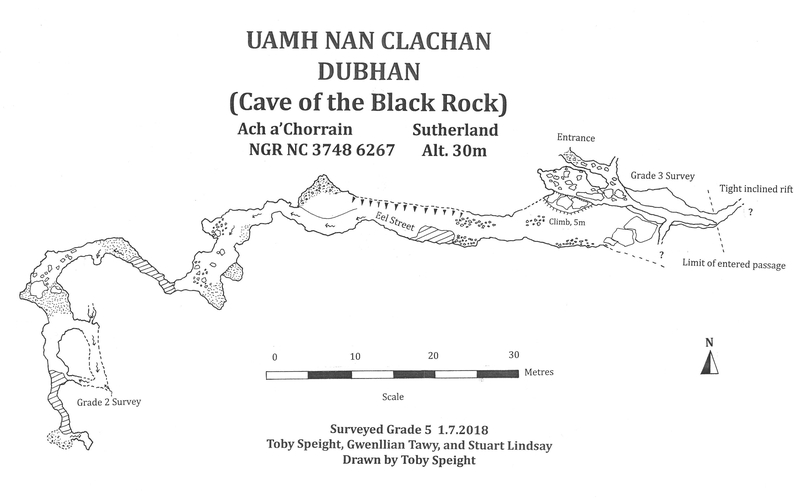 The 2018 winning entry was Uamh nan Clachan Dubhan (the Cave of the Black Rock) in Sutherland, with a total surveyed length of 151.2m. It was handed over on Saturday 24th November at The Hunter’s Lodge which hosted the annual gathering of Mendip and Scottish diggers eager to learn who had found – and surveyed – the most passage during the previous year. Iain Greig of the Grampian SG cave gave an amusing and informative short talk about the winning find. He started by describing how the walk along Allt Ach a’ Chorrain on which the entrance was discovered only took place because he had twisted his ankle while on Mendip, so it was Mendip’s fault, really, that Scotland won! The valley in which the cave was found, the left hand valley leading off from Ach a’ Chorrain, had been looked by J’Rat himself back in the late 1970s and he had made two short finds there. The new entrance was only discovered this year because the turf covering it had dried out and shrunk during the summer drought and fallen back into the hole. 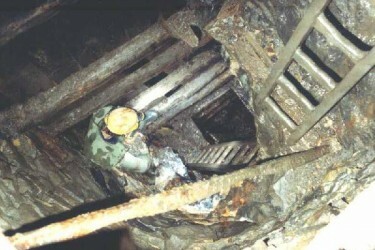 Ian and Neale Menzies explored a short distance into the cave, but given that nobody knew where they were or that the cave existed, discretion ruled and they left the main exploration for a later day. When they returned, after approximately 30 seconds of strenuous digging they were in! A subsequent survey by Toby Speight, Stuart Lindsay and Gwenllian Tawy showed that the cave ran parallel to the valley and at its far end it was approaching J’Rat’s earlier extension, Scorpio Chamber, to Uamh an Coireil So, although there may be little scope for further exploration, a through trip might be forced. 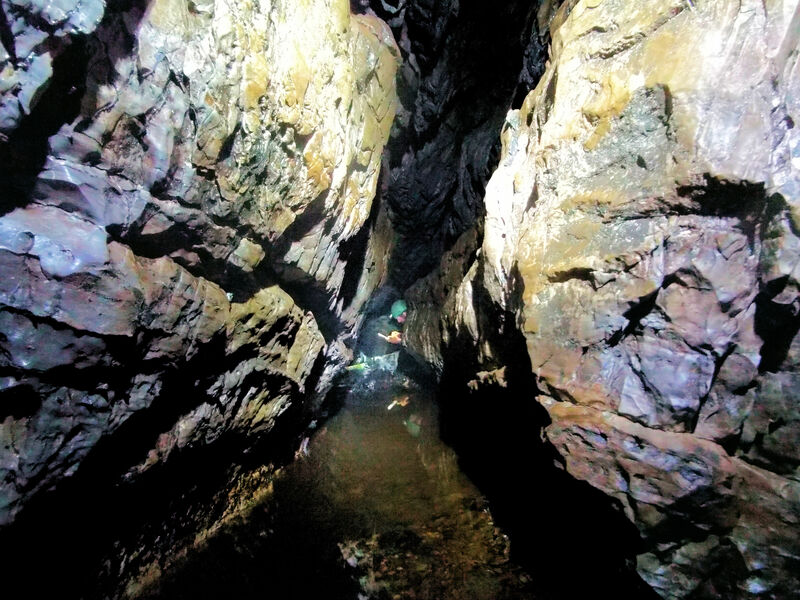 But, the cave is now the longest known on the Durness peninsula, almost twice the known length of Smoo Cave. Total amount of passage discovered over 10 years. This was the tenth year since the award was inaugurated following Tony’s death. The evening’s presentations began with one from Estelle Sandford, who had collected statistics on all the finds made over the last ten years on Mendip and in Scotland. In total, 15,863 m of passage has been discovered and surveyed in that time. Of this, 13,520m (85 per cent) are on Mendip and 2,343 m (15 per cent) in Scotland. 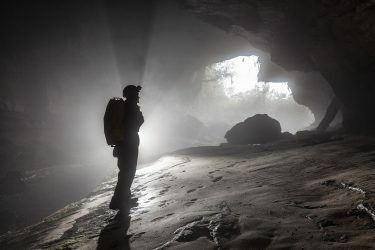 Yet in three out of ten years, a Scottish find has won the award – although Charterhouse Cave has won three times, rather skewing the statistics. 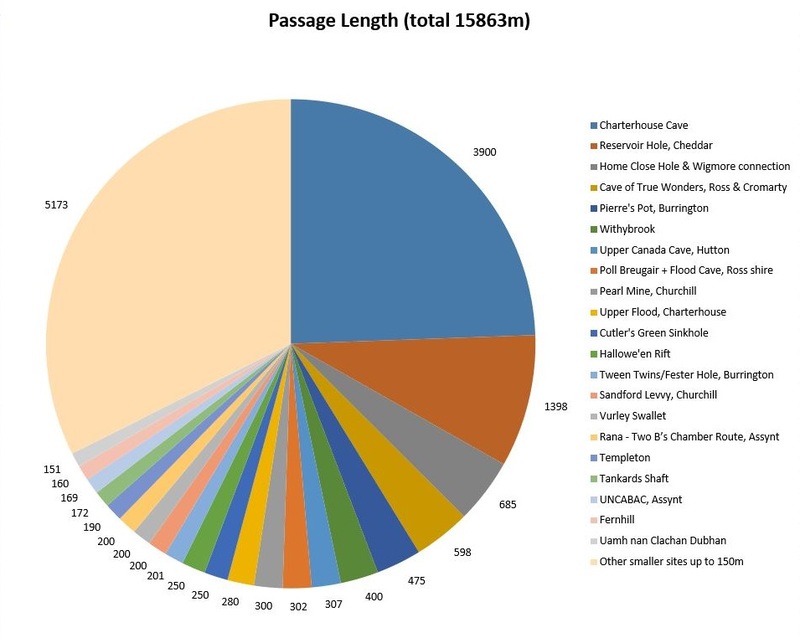 The pie chart shows the respective lengths of the main finds and Charterhouse dominates with 3,900m (nearly 25 per cent) of passage. Reservoir Hole is second on the list with 1,398m found and surveyed. Vince Simmonds gave an interesting talk on work in Halloween Rift, not just on the unexpected development of a 20m pitch, but on the highly unusual find of calcite formations which have been seemingly damaged by ice, during a phase when the cave was filled with water which froze under permafrost conditions. Peter Glanvill followed with a description of work in Vurley Swallet. This, too, has unexpectedly developed a series of pitches, but sadly further progress has been halted since August by high CO2 levels at the bottom. In the video Peter showed, he could be heard to be breathing quite heavily throughout as could his star model, Nick Chipcase. Peter was followed by Alan Gray who described the cave that the Axbridge CG haven’t discovered this year, though work continues, and by Tim Rose who described a number of finds on Portland, which isn’t really on Mendip, but is quite close and is covered by the MCRA. This was another excellent evening and demonstrated to anybody who might have doubted it, that Tony Jarratt’s favourite pastime of digging remains an important and successful part of the British caving scene.